Hi everyone! I'm on my holiday vacation (and I've still a week more) and have been having a wonderful time! I actually plan to do a post about what I've been up to later this week, but for now I'm going to do Rachel's New Year's meme. I love surveys, though I haven't done any yet on this blog so I'm excited to do this! Rachel's doing this in celebration of her reaching fifty followers. I too reached fifty last week, and I also had been pondering about taking the leap of faith and doing my own movie survey. I don't know, what do you guys think? Let me know - if I know people are interested I'll have more confidence to make one! (If I do, it'll probably be in a month or so). As for now, here are my answers to Rachel's! This is also a hard question because I don't really believe in remakes of the classics. Even if a film wasn't all that good the first time, well, Hollywood today couldn't make it any better than it originally was. So out of my devotion to Classic Hollywood I can't really come up with an answer for this one. She was my first experience with a femme fatale, and I think Rita Hayworth did a wonderful job. To me Gilda is the posterchild for a femme fatale, and especially since she was willing to simply "put the blame on Mame," for everything she did. Hmmm... See the sad thing is, I haven't even seen "Leave Her to Heaven," which I know is pretty terrible and I'll have to remedy that soon enough. (I also really need to see "All This and Heaven Too".) 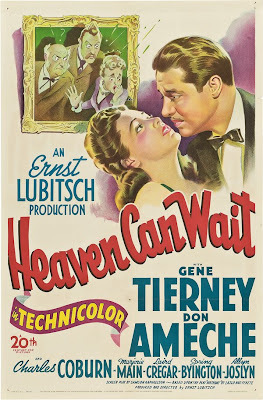 The only movie I can think of (which also happens to have Gene Tierney in it), though it's probably not the best, but I'll go with it anyway, is: "Heaven Can Wait." (1943). Don Ameche stars in it. Don't kill me, guys. Don't send me hate mail or anything! But I'll have to go with Shirley Temple in "The Littlest Rebel" (1935). I actually detest that movie on several levels, and here's another confession: I'm really not that much of a Shirley Temple fan. I respect her because she was one of the biggest movie stars of that era, and I do like a number of the films she made as a teenager, but... still not her biggest fan. Guys, I'm sorry to be annoying again, but I really haven't seen any monster films at all! So I'm going to have to pass on answering this. But for that matter, do you have any suggestions for monster movies? As much as I love film I can't think of one particular film that changed my life. I try not to let things influence me to that certain of an extent. 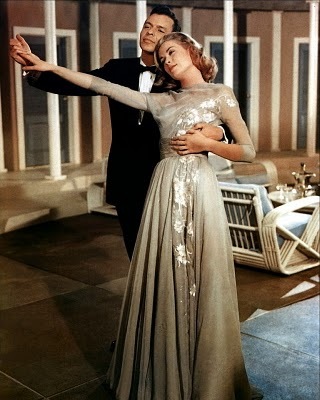 But classic film in general has a big influence on me and the way I act though. (Does that totally override my last statement?). Classic movie stars are my role models and inspirations, which some people may roll their eyes at, but I think I'm getting a lot more out of looking up to Lucy than I would Kim Kardashian (or any other "reality star" of today for that matter). So the basic answer is not one particular film but just classic movies in general. They have a positive influence on me definitely. Hmm. Well one performer that I obviously truly love is Lucy. And I will watch her in absolutely anything, even an advertisement for Snuggies. However, I have to admit, "The Big Street" (1942) is uncomfortable to watch because Lucy is really mean in it. Like, her character is awful. Not to mention it's also a pretty bad movie, THOUGH at the same time I feel she gave one of her best performances (she also looks really gorgeous in this movie). Does that make any sense at all? I guess what I basically mean is that it was hard seeing Lucy play a character so mean and heartless because we're used to the Lucy we all love. But at the same time she did a really good job of playing this cold character, in what is still a 2 star movie. (??? sigh). Before I answer this, I want to make a point of saying that I DON'T LOATHE HER, she's just not one of my favorites and I do think she is overrated. Yes, just a little. But please don't send me hate mail (and besides, I'm actually praising her in this answer). So who is this "her"? Yes, Marilyn Monroe. But I really liked her in "Some Like it Hot" (1958) - it's one of my favorite films in fact and she was quite good in it. In general, Marilyn tends not to be one of my favorites, but I really did like her in this. I think to get better at my movie critiquing and a little more serious about it. So basically to become a better movie reviewer. And I think to also be able to strip down layers of the film - stuff like the actors, the movie score, heck, even the poster - to its core and really be able to analyze that better. I think that's what a real critic would do, and then think about the other stuff afterwards, whereas for me it tends to be in reverse. And since I review a movie every Sunday, I'm definitely going to get a lot of practice in doing this! I'm probably going to write another blog sometime later this week about the fun classic Hollywood related stuff I've been doing over break. But if I'm not able to get around to doing it, well.. then... Have a really happy New Year! And I'll see in you in 2012! Great meme and answers, I love Marilyn though but she can't be everyone's cup of tea. I should reply to this as well and yes if you created a meme I would do my best to participate because I've actually been looking for classic film related memes to do on my blog, so that would be awesome! Love your answers! Found your post on Rachel's page. Yeah, I'm not a Shirley Temple fan either. Too much sugary sweetness for me to handle. As for good monster movies, Bride of Frankenstein is ludicrous, insane, and about the best of the classic genre. 1932's The Mummy is also expertly done. And heck, all the old Universal Studio's monster films are worth seeing: the original Frankenstein, Dracula (though I do find it disappointedly stagy, and the only real acting highlights are Bela Lugosi and Dwight Frye--but boy, are they highlights! ), and the silent Phantom of the Opera. Can't go wrong with those! I love your blog! I love Lucille Ball too! Great job you're doing here! Hi, Rianna. Since you asked, the great tragic movie monster is King Kong. In the immortal words of Dino De Laurentiis: "Nobody cries when the shark dies..."
Beyond that, you can't go wrong with Charles Laughton in The Hunchback of Notre Dame, Conrad Veidt in The Man Who Laughs, Edith Scob in Eyes Without a Face, and Lon Chaney, Sr. in just about anything, but especially The Unknown, He Who Get's Slapped, and The Phantom of the Opera. Nice blog you have here, by the way.